At the Family Winemakers tasting August 17 we reviewed over 20 wineries and tasted at least 35 pinot noirs. But with 160 wineries participating, our sample is still pretty small. We focused on pinot noir and managed to visit most of the 22 wineries we had selected in advance. Belden Barns, open for two whole months, was the surprise of this event. They only produce two pinot noirs, but what a find they are. Located atop Sonoma Mountain between Santa Rosa and Glen Ellen, winegrower Nate Belden and his wife Lauren grow 20 acres of grapes. This site was originally farmed by Dave Steiner in the 1970s. Dave planted cabernet sauvignon, but discovered that the 1,000 foot elevation and westerly breezes were just too cold for cab grapes. He switched to pinot noir in the late 1980s and was very successful in the 90s. Unfortunately, the vineyard had fallen into disrepair when Nate and Lauren acquired it in 2005. They were only able to salvage 1.5 acres of clone 667 planted in 1998. They’re currently growing pinot noir, syrah, grenache, grüner veltliner, chardonnay, sauvignon blanc and viognier. We urge them to rip out the sauvignon blanc and viognier, replacing them with pinot noir. 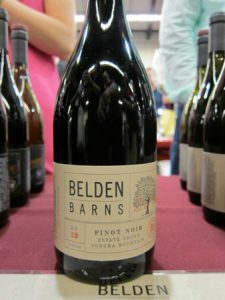 The Belden Barns 2012 Estate Sonoma Mountain ($38, major bargain) was greeted by Tony saying, “Where the hell did that come from?” This wine is a blend of Swan, Pommard and 115 clones. It’s on the big side with a touch of tannins, but excellent. The elevation and ocean fog produces “mountain” berries with thicker skins, giving the wine a deeper color and unexpected flavors. Featuring a balance of black cherries, forest floor, and Chinese five spice flavors, this one is a winner. And, if you’re patient, we predict it will improve with age. Nate and Lauren have interesting stories. Nate grew up on a horse ranch in Colorado. After graduating from the University of Colorado, he went into finance, working in New York and San Francisco. You can read the entire story on the website, but it’s easy to summarize: Nate and Lauren were destined to own this place. Lauren grew up in New York City. She went to Dartmouth, graduating with a degree in English and Creative Writing. Returning to New York, she worked for several ad agencies before opening her own freelance branding and innovation shop. Her official title at Belden Barns is “Chief Creative Cultivator.” If I could put that on my business cards, I’d be happy. Rounding out the team are Chris Bowland, the vineyard manager, and winemaker Justin Harmon. Only Chris has a solid background in agriculture with a degree in that subject from Cal Poly San Luis Obispo. 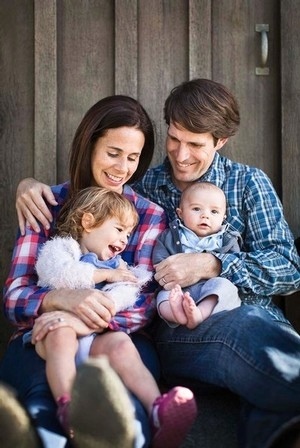 Justin, like Nate and Lauren, got his start far from Sonoma Mountain. He is a refugee from Chicago. The source of his passion for wine remains a secret. But he sure does product good stuff. We predict a rosy future for Belden Barns and are very happy to welcome them to the exclusive group of top pinot noir winemakers. Nate was kind enough to e-mail me with several corrections to this story. He also revealed they are working on a third pinot that will be 100 percent Swan clone. And we are invited to visit them to sample their sauvignon blanc and viognier — Nate seems to think he can convinces us to change our minds about pulling up those vines. Next time we’re up that way we’ll definitely accept his offer.